Learn about product launches and treatment options at the Industry Theaters and Mini Industry Theaters. 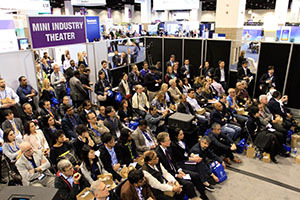 ATS 2016 will deliver several Industry Theater and Mini Industry Theater discussions in the Exhibit Hall Sunday through Tuesday. Have lunch while learning about new product launches and treatment options. Complimentary boxed lunch will be provided by the ATS while supplies last. Attendees will better understand CTEPH and its relation to acute PE, and they will appreciate the importance of reasonable suspicion, accurate diagnosis, and timely referral to an experienced center. Join an expert pulmonologist and radiologist for a multidisciplinary presentation about the diagnosis and management of IPF. Attendees will gain an increased understanding of IPF and its clinical presentation while taking a deeper dive into the challenges associated with making the IPF diagnosis. Parenteral Prostacyclin: Who, When, and How? In light of various therapy options, who is appropriate for parenteral prostacyclin treatment? Join us for a live presentation where we will discuss variables you can use to identify appropriate patients, at the appropriate point in treatment, and how to optimize the conversation. This presentation is open to all ATS 2016 International Conference attendees. Can We Personalise and Simplify COPD Management? As more treatments for COPD become available for patients, ensuring the right patient receives the right medicine for their disease will be key to optimizing their care. The focus of this Industry Theater will be to discuss treatment options to prevent short term deterioration and the issues of personalising treatment for COPD patients. This program features a presentation on Targeting Exacerbations in Moderate to Severe Persistent Allergic Asthma. Complimentary lunch is provided. With prostacyclin class therapy being recommended for treatment of PAH for more than a decade, this session will focus on the use of an oral prostacyclin class therapy in the early treatment of PAH. Discussion will review the clinical data and practical applications for initiating an oral prostacyclin class therapy in prostacyclin naïve or stable parenteral patients. Pulmonary arterial hypertension (PAH) and chronic thromboembolic pulmonary hypertension (CTEPH) are characterized by elevated pulmonary artery pressures and increased pulmonary vascular resistance. Impaired synthesis of endogenous nitric oxide contributes to the pathology of both diseases. PH experts will present and discuss cases that demonstrate how targeting the NO-sGC-cGMP pathway can contribute to goal-oriented treatment approaches. Discuss sleep-disordered breathing (SDB) that occurs in patients with congestive heart failure (CHF). Compare advanced positive airway pressure modalities in the management of SDB that occurs in patients with CHF. Examine recent research and discuss specific indications and limitations of servo ventilation. A dynamic, expert-led debate which will highlight the considerations that impact initial COPD maintenance treatment decisions. During this Novartis supported mini industry theater, experts involved in the recently completed FLAME study will discuss key findings from the study, its importance in understanding the effects of indacaterol/glycopyrronium in high-risk patients, and the potential implications for treatment guidelines and clinical practice. Managing exacerbations remains a challenge for patients with severe COPD. Join us for a dynamic case-based presentation led by an expert panel. The objective of this program is to provide health care professionals with insights into the complexities associated with COPD exacerbation management as well as strategies for reducing the risk of exacerbations in severe COPD patients. This lecture will discuss treatment options for patients with deep vein thrombosis and pulmonary embolism, and how they can reduce the risk of recurrent thrombotic events. The objective of this presentation is to provide pertinent, balanced information to health care professionals on the efficacy and safety of nebulized long-acting bronchodilator therapy for patients with COPD. It is designed to afford health care professionals the opportunity to review, evaluate, and discuss the role of nebulized long-acting bronchodilator therapy as an option for patients with COPD, including chronic bronchitis and emphysema, in order to make informed treatment decisions for their patients. Join us for a 45-minute Insights in IPF educational program examining the evolving understanding of idiopathic pulmonary fibrosis (IPF), including the science of the disease and the complexity of diagnosis. An expert in the field of interstitial lung disease will provide insight into the challenges of managing a patient with IPF, with perspectives on how to address these challenges in the clinic. During this Novartis-supported industry theater, a faculty of world-renowned experts will explore the burden of COPD exacerbations and new evidence for exacerbation prevention in high-risk patients with dual bronchodilator indacaterol/glycopyrronium. The potential implications of these data on the position of dual bronchodilators in COPD management also will be explored. Discuss a program to reduce hospital readmissions for the COPD patient.